READ IT DIANA, AND SCREAM IN PAIN WITH ME XD This book left me crying in my bedroom, and my boyfriend shocked and horrified. Beautiful review! This book has been on my TBR for too long and I need to read it this year, definitely. Be careful, Josie, it will seriously stomp on your heart. But I MUST recommend it! I think I’m ready for a bit of heart stomping… although, after I read Queen Of Shadows, I’m not so sure! I’ve been wanting to get my hands on this book for a while now. I always seem to gravitate towards contemporary books that pack an emotional punch. I feel like this will be one intense, emotional read. Great review. More Happy Than Not is truly fantastic! I hope you’ll give it a go. Try it out when you are in a masochistic mood for some heart stomping haha. Okay but I did a tag for MHTN and had it thrown at me by twenty different bloggers and I had NO CLUE about the memory thing? Like HOW? BECAUSE THAT SOUNDS SO COOL. And friendships that become romances? And all the diversity? And also what sounds like a crazy wonderful boyfriend and an equally wonderful ex girlfriend? LIKE TOO AWESOME FOR WORDS. The memory thing is such a clever way for the book to address so many of its issues! All the characters are both wonderful and infuriating all at once, just like real people. IT IS AWESOME. ALSO HEARTBREAKING. I hope you’ll check it out! I’ve heard about this one before but I never really knew what it was about, I was kinda just like ‘whatever’. But after reading your review, I really want to read it! I’ve been on a contemporary kick for awhile so I’ll definitely pick this up soon 🙂 It sounds so good, great review! I would definitely recommend it if you like hard hitting contemporary books, this book dealt with a lot of issues on happiness and sexuality in a complex, realistic way! I hope you’ll enjoy it. This book sounds very interesting! I’ve heard lots of people rave about it, though I’m not a fan of overly sad books (I find them to get a bit boring sometimes), but I think I might give it a go. Great review! This book sounds like its right up my alley. I’ll have to check this out; thanks Aentee! That sounds like one beautiful research paper, knowing how beautiful your writing is, I am so curious to read it. 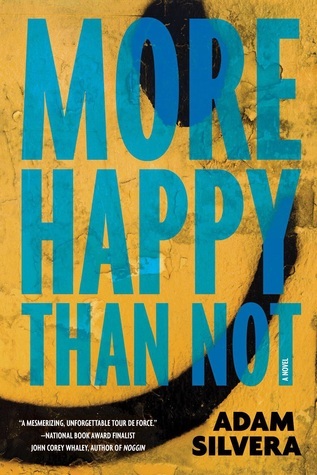 Happiness is a tough thing to figure out, and doubly so for the characters in this book! I think you’ll like it, hope you have the chance to check it out sometimes, as I would love to hear your thoughts! It was wonderful and eye-opening. 🙂 If you want to read it, I wouldn’t mind sharing it with you! You should 100% check this out Ju, it’s a quick read and totally worth the tears and pain 😀 I will be here to hold your hands! EEEP thank you Kells *blushes* I think if you loved ATBP you would absolutely love this book – it’s painful but important and 100% worth the tears and tantrum. I still can’t make my peace with the book, an entire week after I finished reading. I really should pick this up already, shouldn’t I? I definitely have high expectations, having heard infinitely wonderful things about Adam Silvera’s debut but mostly I’m really excited to get to know the author’s writing, having met him personally at an event awhile back. I do love thoughtful and complex books so I think I’ll really enjoy this one. So glad to hear you loved it, Aentee! I’ve heard such incredible things about this and am glad to hear you loved it so much! I read a chapter when my pre-order arrived, but wasn’t feeling it or ready for something so heavy, so will have to try again later. Lovely review and graphics! UGH Aentee, whyyy? I have been resisting this book because I know it’ll make me ugly cry, but you make it sound so good I can’t help but want to read it! The whole question of why happiness is so difficult/elusive is something that impacts everyone at some point – I’m curious to see how it all shakes up. 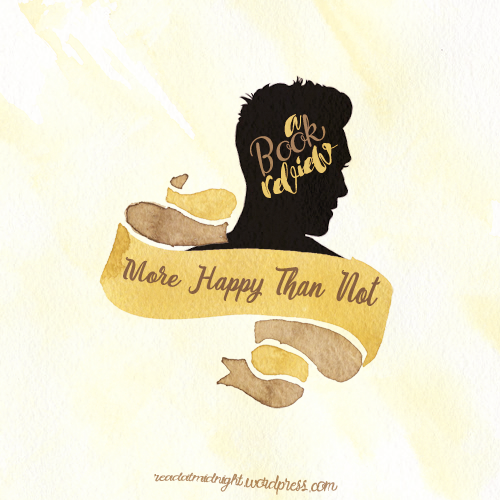 I am so glad you finally got the chance to read More Happy Than Not! Now, I am not the only person whose feelings got messed up by Adam Silvera. Adam Silvera totally stomped on my heart and feelings, HOW CAN YOU DO THAT TO AARON? But I am totally keen to check out his new book when he’s finished writing it! I don’t know how he was able to manipulate our emotions without any problem, but he did it flawlessly. I was like wtf just happened? Why am I crying? I know, the book totally sucker punched me, right from the moment Aaron confessed his feelings to Thomas I was pretty much GONE *sobs* AND THEN IT ALL WENT DOWNHILL. I TOTALLY UNDERSTAND YOU! I had my girl read the book (because I will not allow her to miss out on some ugly crying) and she finished it in one sitting! Adam and his power, I tell you. So glad to hear you loved this, so far I’ve only heard rave reviews! I pre-ordered a copy and went to read it a few months back, but put it down because I don’t think I was prepared for how dark it was going to be. I know I’ll revisit again in the future though! Fabulous review.